Suggestions for improvement are desired! 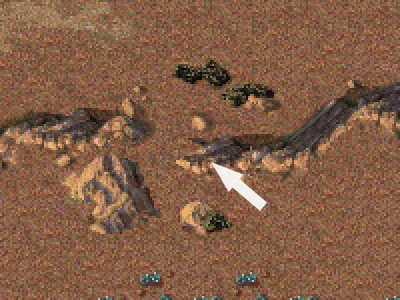 The first one is that seem to have intentionally added an infantry-only crossing from the north through the cliffs to the western tiberium field, but cliffs end abruptly under the invisible terrain objects that you placed over the gap. You could fix this by placing a proper cliff ending there, but since none of the other players have such a crossing either, this only gives the North-West player an unnecessary advantage and I think you'd be better off removing that crossing (especially since this map seems to be intended to be a symmetrical tournament map). The other problem with this map is the size of the visible area. If you test this map ingame, you'll find that the bottom 3 or 4 cells are missing from the map and this always happens when at the bottom of the map, the visible map area's border (the blue rectangle) is too close to the actual map's border (the red rectangle). So to fix this you need to increase the map's size enough to create at least a 4-cell gap between the red and blue rectangles at the bottom of the map (on some maps 3 cells is enough however, so you can try that as well if you properly test it). Additionally it'd be beneficial to add a gap of at least 1 extra cell to the top of the map in order to prevent visual issues with aircraft that fly outside of the map during a bombing run. To do this, you need to click "Edit" at the top of the map editor's window and then go to "Map". There you need to click the "Change" button under "Map size" (it's the top button), then change the "Height" value (notice that the value for "Top" automatically changes as well when you do this) and then properly change the value for "Top" to control how many of the extra cells you're adding to the height will be added to the top of the map (and everything that isn't added to the top will obviously be added to the bottom). Now click OK (and Yes when you're warned that tunnels may be damaged) and make sure you don't close the Map Properties window yet. Notice that the Visible area's size (the blue rectangle) will have changed along with the Map size (the red rectangle, meaning that the red and blue rectangles still overlap at the bottom of the map) and you can click the "Change" button under "Visible area" to restore the previous size of the visible area. Whether you do this or not, you now need to adjust the numbers in the field under "Visible area" to make sure map's visible area has the correct size and click the "Change" button next to the numbers after every change in order to see how the blue rectangle changed. As mentioned, you need at least 3 or 4 cells between the red and blue rectangles at the bottom of the map in order to prevent cells from getting unintentionally cut off there ingame and there's really no need to exaggerate and have more than 4 cells between them unless it serves a purpose (like when you're making a mission where the map expands at some point or you need to hide AI power plants outside of the map). DTA doesn't have too many "tournament" maps, but I think this one could make a good addition once once the issues I mentioned are fixed. Looks good now. One thing to keep in mind though, is that the neutral units you placed on the map have weapons and thus affect gameplay. While some are placed far enough out of the way to never get in the way of players, others are close enough (or can fire far enough) to be a bother and having to deal with them takes your focus away from your actual opponents (who don't have to deal with such neutral units) and this can put you at a disadvantage. So it'd be best to not have armed neutral units near areas that aren't easy to avoid (such as the bases of the players, as well as the paths harvesters need to travel to get to resources).